In our comparison on the Samsung Galaxy S9+ and Galaxy Note 8, we’ve recommended that users should just have to wait for the Samsung Galaxy Note 9 before upgrading their phones. 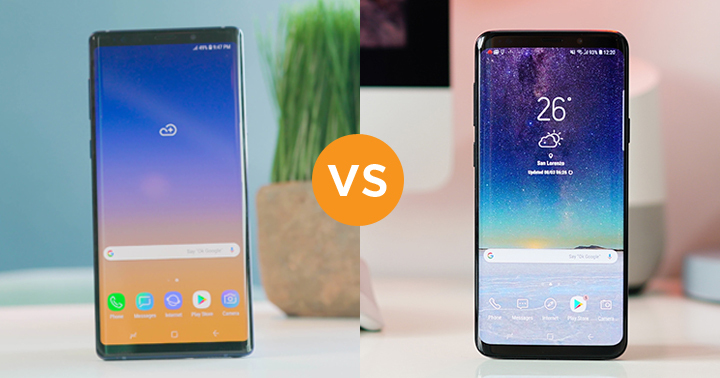 Now that it has officially launched, it’s high time we compare the two devices, the Galaxy S9+ and Note 9, and see what’s different. The Samsung Galaxy Note 9 is the latest flagship smartphone from the Note series. It sports a 6.4-inch Super AMOLED display with 2960 x 1440 resolution, an Exynos 9810 octa-core processor, 6GB/8GB RAM, 128GB/512GB internal storage, dual 12MP rear cameras, 8MP front, and 4,000mAh battery with fast charging and wireless charging capabilities. The Samsung Galaxy S9+ is also a flagship device but from the S-series, sporting a 6.2-inch Super AMOLED display with 2960 x 1440 resolution, same Exynos 9810 chipset, 6GB RAM, 64GB/128GB/256GB internal storage, dual 12MP rear cameras, 8MP front, and 3,500mAh battery with the same capabilities. The Note 9 has the upper-hand in terms of screen size as it is larger than the S9+’s, however, the latter gives off a higher pixel density due to its smaller display. But in terms of viewing experience, the former is the better pick. Both smartphones have the same chipset, however, when we tested them using the AnTuTu benchmark app, the S9+ yielded a slightly higher score than the Note 9 but in terms of real-world performance, the difference in scores won’t matter. The battery capacity is where the Note 9 shines. It is definitely larger (by 500mAh) compared to the S9+’s. In our video loop test, the former was able to provide 20 hours of playback while the latter only lasted for 16 hours. The Samsung Galaxy Note 9’s price starts at Php55,990 while the Samsung Galaxy S9+’s price starts at Php45,990. The post Samsung Galaxy Note 9 vs Galaxy S9+: What’s different? appeared first on YugaTech | Philippines Tech News & Reviews.